With Tropical Storm Isaac still gaining strength and possibly getting hurricane status, it still hasn’t deterred people from protesting at the upcoming Republican National Convention (RNC). 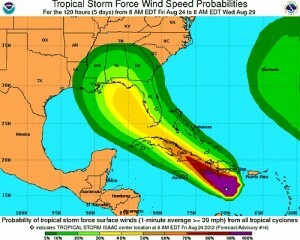 The convention starts on Monday and organizations are preparing plans in case Isaac delivers powerful rain and winds to the Tampa area. A coalition of protesters laid out their plans for the upcoming Republican National Convention. They have demands, and they’re hoping the world will listen. The Coalition to March on the RNC says their message is simple. “We’re here to demand good jobs, healthcare, affordable education, equality and peace,” said Jared Hamil, a spokesman for the Coalition to March on the RNC. They held a press conference Wednesday morning at Perry Harvey Sr. Park in downtown Tampa. It will be the site of one of the largest rallys planned for the RNC.